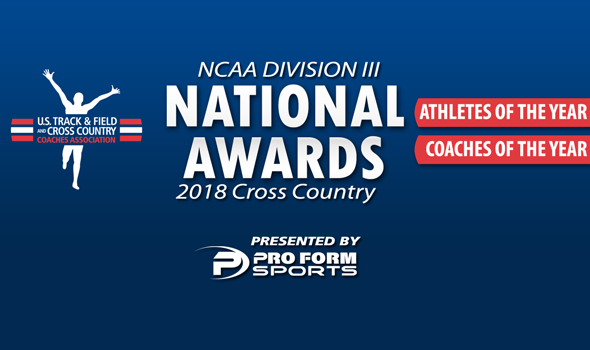 NEW ORLEANS – National Athletes and Coaches of the Year for the 2018 NCAA Division III Cross Country season were announced Tuesday by the U.S. Track & Field and Cross Country Coaches Association (USTFCCCA), following the national championship meet this past weekend in Winneconne, Wisconsin. Dhruvil Patel of North Central (Ill.) and Paige Lawler of Washington (Mo.) were named the Men’s and Women’s National Athletes of the Year, respectively, following their individual victories at Lake Breeze Golf Club. Al Carius of North Central (Ill.) and Jeff Stiles of Washington (Mo.) were named the Men’s and Women’s National Coaches of the Year, respectively, after leading their respective teams to national titles. Dhruvil Patel left no doubt that he was the man to beat in NCAA Division III Cross Country. The senior from Skokie, Illinois, capped the season with a five-second victory at the 2018 NCAA DIII Championships this past weekend. He covered the 8K tract in 24:24.5, 39 seconds faster than when he ran the same course in October at the KollegeTown Sports Invitational. Patel won four other individual titles this past season, in addition to the all-important NCAA crown. He started things off with a victory at the Earlybird Invitational, followed that up with a win at the ISU Invitational, cruised to the victory at the aforementioned KollegeTown Sports Invitational and was first across the finish line at the CCIW Championships. Patel is the first athlete from North Central (Ill.) to be named Men’s National Athlete of the Year since John Weigel in 1995. Paige Lawler rose to the occasion in the NCAA Division III Cross Country postseason. The junior from Lexington, Massachusetts, won two individual titles when the stakes were the highest – including the most important one this past weekend at the NCAA meet. It was this past weekend at the Lake Breeze Golf Club where Lawler crossed the finish line first in 20:55.0, three seconds ahead of the runner-up. That was significantly faster than when she ran the same course in October at the KollegeTown Sports Invitational (21:31.6). Lawler started the postseason with a victory at the UAA Championships, then finished runner-up at the Midwest Region Championships, less than two seconds behind the eventual winner. She is the first WashU athlete to be named Women’s National Athlete of the Year. Al Carius is the man that keeps the Cardinals flocking to championships. Carius led North Central (Ill.) to the team title at the NCAA Division III Cross Country Championships this past weekend. The Cardinals put four runners in the top-11 – led by a 1-2 finish by Dhruvil Patel and Al Baldonado – and won the national title by 67 points. North Central (Ill.) went undefeated against NCAA DIII competition this season and even won the heralded Louisville Cross Country Classic against several top NCAA DI programs. This is the 12th time in the past 25 years that Carius has been named Men’s National Coach of the Year. Washington (Mo.) needed to run a perfect race to win the women’s title this past weekend in Winneconne, Wisconsin. Jeff Stiles had his athletes ready to perform. The Bears used a complete team effort to upset top-ranked Johns Hopkins and capture their first NCAA title since 2011. WashU put two runners in the top-10 – led by individual champion Paige Lawler – and won by one point over the Blue Jays. WashU went undefeated against NCAA DIII competition this season and finished sixth against a loaded field at the Loyola Lakefront Invitational in late September. This is the second time that Stiles has been named Women’s National Coach of the Year. He also earned the honor after the Bears won the national title in 2011.